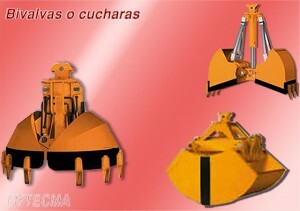 Buckets or bivalves for earthworks and various materials. Models with half open clamp from 600 mm to upper ranges with 5,100 mm openings. Its capacities can vary according to models from 0.03 m3 to 23 m3.